Free interview score sheets are well-structured papers where an interviewer can record and grade interviewees based on their documents, skills, and answers offered during an interview. The interview is an integral part of the recruitment process since it is a platform where the potential employee and employer interact. A good interview score sheet will ensure that you can evaluate the candidates’ competency. The interview can prepare relevant questions to pose to the interviewees to ensure the right candidates are selected. An interview score sheet gives structure to the interview process to ensure that all candidates are exposed to the same criteria of assessment. 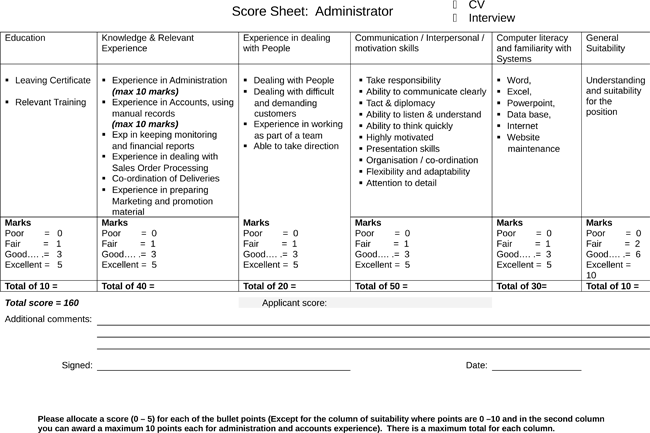 An interview score sheet can enhance the transparency of an interview and make the selection process faster. The interviewer can concentrate on the non-verbal cues the interviewees make instead of facing down to record answers during the interview. The use of score sheets reduces the documentation that the interviewers make. It also allows better comparison of the results given by different panelists for the same candidate. First, you should select the type of template that you will use during the interview. You can choose one from the variety available on the website. Ensure you include some general questions to assess common knowledge, specific questions that require technical answers to assess the skills and compatibility questions to know whether the candidate is a good fit. It is advisable to use a scale from 1-5 or 1-10 for each of the questions. Such a grading system can allow a faster comparison of the total score for each candidate. You can weight some of the questions that are more important than others in the interview process are. For example, technical and compatibility questions should be worth more marks than general questions. Related: Print free Softball Score Sheets. Selecting the right candidate during recruitment is crucial in ensuring proper employee-job fit. 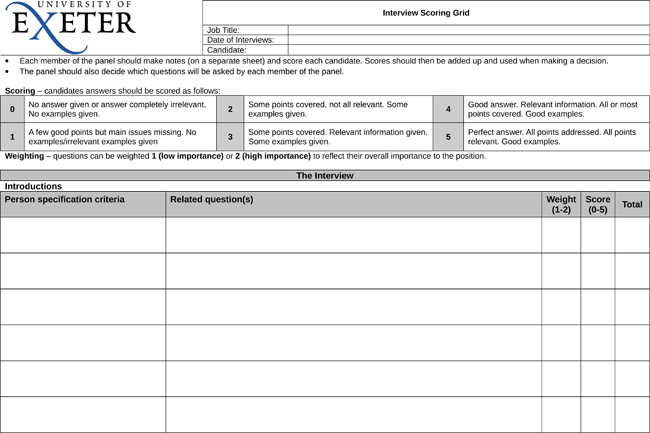 Free interview score sheets can help an interviewing panel to select the right candidate. Take advantage of the free templates provided to elevate the standards of your interview process.